The United Methodist E-Reader Project recently got a boost through obtaining Portuguese content for e-readers for theological schools in Angola and Mozambique. Rev. Adriano Quelende, director of Global Formation for Spiritual Leaders at the General Board of Higher Education and Ministry (GBHEM), recently visited the annual conferences of Angola East and West, as well as Mozambique North and South annual conferences and acquired additional theological content for the Portuguese e-readers. 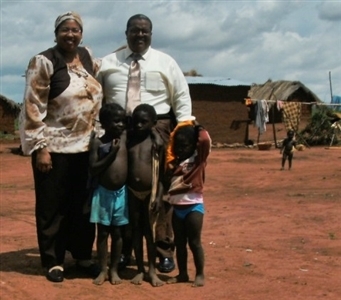 Missionaries Cleivy and Leonardo Garcia stand with children from the Quéssua mission in East Angola. Photo from Cleivy and Leonardo Garcia. 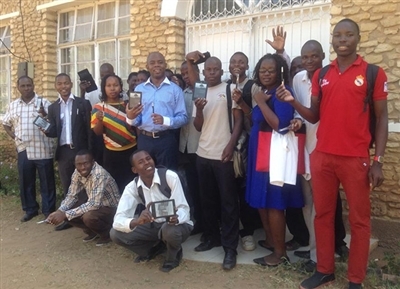 In each area, Quelende visited schools of theology to deliver a few e-readers and showed librarians, teachers and students how to use the e-readers. Quelende and staff of Discipleship Ministries will return to these areas in 2015 to deliver more e-readers and to provide complete training. The School of Theology at Quéssua in the East Angola Conference, which is in covenant with the Florida Conference, was among schools to receive the technology. “With the e-readers, our students can access much-needed resources at any time and any place without having to come to the (school’s) library to use our printed resources," said Rev. Dr. Leonardo Garcia, a missionary from the Methodist Church of Cuba who teaches at the school. Garcia is based at Quéssua with his wife, Rev. Dr. Cleivy Garcia, who is the school's vice dean. Icel Rodriguez, Global Missions director for the Florida Conference, said the conference was involved in the project by identifying theological resources in Portuguese that could be put into PDF format for access by the readers. She said she anticipates some more readers will be delivered to the school in 2015. The GBHEM and Discipleship Ministries are continuing to grow the E-Reader Project, a simple way to help theology schools in remote areas have access to current textbooks and reference books. Quelende, a West Angola native, also met with bishops, theology school deans, pastors and students in each annual conference to hear their ideas about additional theological content and the growth of the project. Rev. Adriano Quelende, center, and students at a theology school in Africa show e-readers that will expand learning opportunities for Portuguese-speaking ministers. Photo from GBHEM. In Angola West annual conference area, Quelende met with Rev. Kalumba Alfredo, general secretary of the Angola Bible Society. The Bible Society was impressed with the project and offered over 500 Portuguese books, in digital format, to be loaded on the e-readers. Portuguese content continues to be added to the e-readers, with the help of the Methodist Theology School in Sao Paulo, Brazil. Dr. Paulo Garcia has pledged wholehearted support and has donated numerous texts to the project. The e-reader currently includes ebooks on Christian education, evangelism, preaching, counseling, church leadership, United Methodist worship and Wesleyan theology. Some suggested more books about the history of Methodism, Bibles in different African languages, hymnals, The Book of Discipline and books with United Methodist liturgy. In addition to GBHEM and Discipleship Ministries, funding for the E-Reader Project comes from annual conferences, local churches, individual donors, universities and from the students themselves through a student fee each semester, which helps offset the price of the e-reader and its content. To learn more or donate online, visit www.umcereader.org. -- Smeck is interim director of the Office of Communications at GBHEM. Susan Green, managing editor of Florida Conference Connection, contributed to this story. To access the original version, click here.